It is August 12, 1945. Japan is reeling and on the verge of surrender in the wake of atomic bomb attacks on Hiroshima and Nagasaki. With Germany having surrendered to the Allies back in the spring, Europe is already in postwar mode, though not exactly at peace, as we are about to learn. For, this bright, summer day is when Samuel Hermann (Ivan Angelus) and his son (Marcell Nagy) disembark from a train that has just rolled into their rural Hungarian hometown. Oddly, their arrival doesn't inspire the locals to celebrate the fact that a couple of their Jewish neighbors carted away by the Nazis had miraculously survived the Holocaust. Instead, the easily identifiable Orthodox pair are greeted with suspicion, because their property had long since been appropriated by somebody in the tight-knit town. So, as they load their luggage onto a horse-drawn-carriage, the village notary (Peter Rudolf) directs the driver (Miklos B. Szekely) to go very slowly. The delay buys him the time to ride ahead and thereby serve as a latter-day Paul Revere to the rest of the community, warning, "They're here! Jews are back!" Among his ports-of-call is the drugstore the Hermanns had been forced to leave behind which is now in his own son's (Bence Tasnadi) hands. That is the compelling point of departure of 1945, one of the most intriguing Holocaust dramas to come along in years. After all, it addresses a question generally swept under the rug by historians, namely, what kind of reception awaited concentration camp internees who opted to repatriate rather than emigrate to Israel. 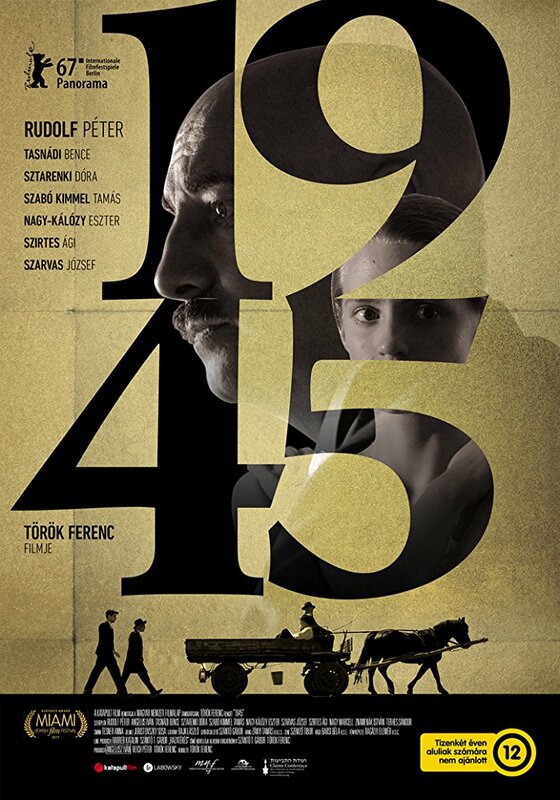 Directed by Ferenc Torok (Moscow Square), the film is based on "Homecoming," a short story by Gabor T. Szanto. The picture was shot in black & white, which serves to amplify the solemnity of the Hermanns as they walk in silence behind the deliberately-paced buggy. Their dignified behavior cuts such a sharp contrast with that of the suddenly-alarmed citizens, most of whom respond by closing ranks and wondering how many other "interlopers" might soon assert claims to land they'd taken title to legally. A powerful parable of Biblical proportions, illustrating both man's inhumanity to man, as well as his capacity to forgive, if not necessarily to forget.